Ready for a night out? In the board game Bratz: Passion for Fashion you and your other Bratz friends are getting ready for a night out on the town. Now, what do you need for the perfect night out? The perfect outfit of course. Off you go searching through your closet and the closets of the other Bratz girls to find the clothes you want to wear. 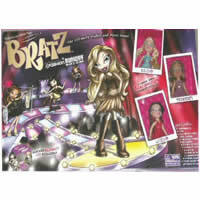 Bratz: Passion for Fashion is all about being prepared for a night out by finding the perfect outfit and hairdo. Can you find the perfect combination? Check out Bratz: Passion for Fashion for a fun game that will have you racing around the board to find the perfect outfit. To win Bratz: Passion for Fashion game you must be the first player to return to your Home space with your four fashion tokens. Please keep in mind that the official Bratz: Passion for Fashion board game rules and instructions could be different depending on the game version you have. The rules below are some of the exact directions on how to play Bratz: Passion for Fashion. Share with us your comments, funny stories, tips, advice, strategies, creative ways to play, questions about how to play, problems with the rules or anything you want about Bratz: Passion for Fashion. All submissions will be reviewed within 24 hours. Click here to add your Bratz: Passion for Fashion comments.